ALL IS HELPFUL! THANK YOU! organized a phone support to check signs of life, but we (SAFOB) aren’t in Germany and so no one can read letters. we ask you to rescue, shelter the health and life of Bruno. Stand to humanity! Thank you! We ask for aid and asylum on humanitarian, political and international legal reasons for Mr. Bruno Schillinger. Or a temporary residence permit to get medical treatment (kidney, eye, skin, backbone, diabetic, etc.). Temporary sound a bit strange, than doctor said in February 2013: ‘your ship is sailed in five years, finally‘. WHY THIS MISTREATMENT, MURDER OF DISABLED BY GOVERNMENT? 1. Bruno stand for humanity in daily life! 3. Bruno wants to investigate the unexplained death of his father and the entanglements of a CDU politician. The politician let Bruno’s father completely lonely die – did not inform the family – said the doctors ‘family does not want to come‘ – took the savings (cash) from the account of the dying, since the € 33,000 disappeared – let the dead burn up, buried anonymously against Bruno’s will and thereby cheated with full powers (after 3 years his son-in-law showed the proper powers), no investigation again. His party friends protected him. Authorities, politicians do everything to annihilate Bruno. This was the beginning of Bruno’s way to death and the evidence that human rights are completely worthless in Germany and the nasty Nazi methods come up again. Some examples: Illegal imprisonment, abduction/carryover, suspension/exposure without water, food, medicine…. in order of this CDU politician NO investigation * Legalize crimes by blackmail: ‘diabetes medicine if you accept incapacitation‘ and if you accept your disenfranchisement, you could get food. NO investigation * All in order of politicians & authorities – methods like in Nazi era. We ask for aid, shelter, life on humanitarian reasons! Bruno can’t read due eye problems since Aug. 2009 (caused by public authority), did not get any aid (not even reading loud machine), fear blindness and has not enough food, medicine. Mr Christian Schroff – office link* – head of local authority for people with disabilities (so expert for disabled law and executing murderer (= every person which refuse human food, diabetic treatment,….) refuse all human rights e.g. he refuse right of life –refuse access to justice,…. torturing human like the nasty Krauts in III. Reich! Torture Bruno by refusal food, diabetic & medical treatment, counselling. He knew exactly the bad situation of Bruno and the need of food, aid. He is waiting for the dead of Bruno, starves him, so he is murdering like nasty Krauts. He is completely full of inhumanity, criminally, brutality, is nasty and wants to cover up his crimes against human rights and humanity. The other executing murderer are Mrs Kathrin Celmeta, Mrs Diana Retzer (jobcentre) and Mr Guenter Menzemer (state council, fully qualified lawyer/jurist). He sounded ‘if you have no food, send anyone to beg‘ or refuse of food and diabetic treatment by authorities is neither attempt murder nor other crime – so he legalized euthanasia and government, parliament confirmed this crime. The heads of office e.g. Mrs Dagmar Manser, Mrs Dorothea Stoer-Ritter, Mrs Baerbel Schaefer, command this crime against humanity Political commanding murderer: prime minister of Baden-Wuerttemberg Mr Winfried Kretschmann GREEN, ministers for work & social Mrs. Katrin Altpeter SPD, interior Mr Reinhold Gall SPD, justice Mr Rainer Stickelberger SPD and complete parliament. Besides Mrs Manser refused face to face e.g. food, diabetic medicine and any information, send Bruno to death. We offered again and again meeting, mediation, “all the facts on the table” to clear the air – all ignored by the authorities and politicians – motto ‘don’t disturb us, be quiet and die asap‘. Question to everyone: Is their any other benefit of refusal of food, diabetes medications, except social racism, murder, euthanasia? We ask for aid, shelter, life on political reasons! Bruno Schillinger is fighting for truth, justice and human rights. His father had to die lonely, because a Christian politician did not inform family about the stay in hospital and weeks of agony, said doctors ‘family has no interest‘ and had time to take all saving in cash (€ 33.000,-).This politician is protected by all his colleagues and officers and government. No investigation for this dubious death, nor deeds in his public authority nor due the illegal arrest, carryover and exposing in his order. All political parties refuse their own fundamental party constitution and human rights. Sometimes we got hint ‘go to this public authority‘ – we did, wrote all again and again. Sometimes, but seldom, the person contacted the other authorities, and was lied or after month ‘I can’t do anything‘. Besides there is a complete system of highly paid staff with impressing title e.g. Federal Disability Officer or Ombudsman. All have in common, they will not start investigation, give aid, grant human rights. They even can knock on door and beg for information. But this is a secret. It looks for citizen that he is wrong and his claim is not right – but a Disability Officer or Ombudsman can’t claim for any information or can’t order anything. This is completely unknown and secret. They only count bodies. The mistreatment of Bruno Schillinger started among the government of CDU and FDP. Therefore, it would have been easy start investigation, when government changed. But the new government (SPD, GREEN) did nothing and continued this crimes. Disabled are worthless, without rights, no humans! ….. Prime Minister and his government breaking their oath of office, are perjurer, have no honour! Summary: Bruno is political refugee to hush up misdeeds, crimes of politicians, government, …..
We ask for aid, shelter, life on international law reasons! Federal and state attorney ignore complaints for human rights, refuse so ‘access to justice‘ (Art 13) and human rights. * Courts refuse assigning a lawyer and answer. * there is a long list e.g. denial of human rights, discrimination, murdering……..
Have youMrs/Mr xxxxx, your involved, informed colleagues, supervisors, agencies, ministries, etc. acted at Mr. Bruno Schillinger; Bachstrasse 1, 79232 March, Germany according to social laws, state constitution of Baden-Wuerttemberg, German constitution, HUMAN RIGHTS, UN Disability Convention (Federal Law) – Yes or No? and NO one answered! Certainly all will say ‘all is legal‘ – we remember ‘Never forget that everything Hitler did in Germany was legal‘ – and all German learned this in primary school! More reasons? More information? Speak to Bruno! 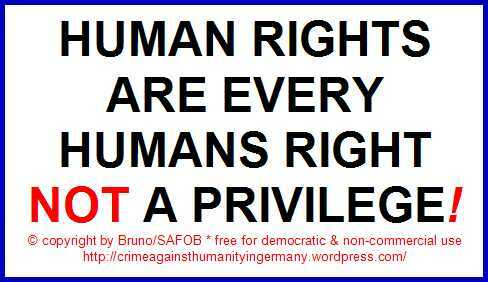 You do not believe that Germany denied human rights and people are being abused, tortured? All is documented on the internet for years including the names of the offender and nobody of them protested against. Help to save health and life of Bruno, please. All is helpful, from care package, direct support, …..
We looking for a lawyer to claim all the costs for aid, support from Germany, so that the new homeland has no damage. This document was send to government, authorities & murderer of Bruno – weeks before publishing! Please only phone/call 0049(0)7665-930450 with Bruno Schillinger. Because he can’t read itself at present by the ill-treatment by ARGE / District Office / Social Court and we are not on site! The authorities denied any assistance, no reading loud machine, or any counselling! 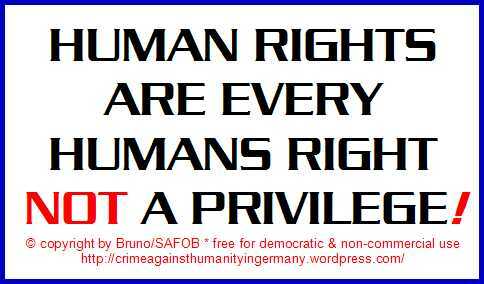 THE new NASTY GERMAN?NO HUMAN RIGHTS FOR DISABLED! did not stop this crime against humanity! he did not answer, So he ordereD mistreatment of disabled! he starves disabled people!